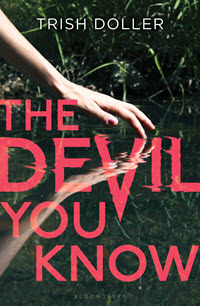 kt literary » Blog Archive » THE DEVIL YOU KNOW is “Hitchcockian”! THE DEVIL YOU KNOW is “Hitchcockian”! Arcadia grew up fast when her mother died. She cares for her younger brother, works at the family grocery store, and fills in as the head of the household when her dad just can’t do it. Now she is 18, and the summer is calling to her in the form of a campout with old friends and a few very hot strangers, including the cousins Noah and Matt, who are road tripping in their late grandmother’s 1969 Cougar. Cadie effortlessly pulls Noah into a heady fling that gets deadly serious when they leave town together. Cadie is strong, confident, secure in her sexuality, and totally in control . . . until she isn’t. The best weekend ever quickly takes a 180. Mounting clues lead Cadie to fear for her life and a growing uncertainty over which of the dashing cousins to trust: charming Matt or reformed bad-boy Noah. As the stakes increase and the opportunities for escape deep in the Everglades narrow, the Hitchcockian conclusion is swift and satisfying. Pre-order a copy today at IndieBound, Amazon, B&N, or your local independent bookstore, or add it on GoodReads! ← Congratulations Ashlyn Macnamara – our newest USA Today bestselling author!